In the 21st century the role of the question plays out in a unique setting. The volcanic pressure of the knowledge explosion will continue infinitely into the future. The nonlinear forces at the foundation of this explosion are still largely misunderstood or unknown yet constantly generate new stimulating mysteries. In this ever more turbulent setting, questioning is far more than just valuable, it is the essential ingredient to shift any scale of community and anyone at any age from surviving to thriving. If we accept with the philosopher Karl Popper that all life is problem solving (1991), then solutions (making/composing) begin with question seeking skills. As long noted by educational luminaries including Montessori, Dewey, Freire, Piaget and Papert questions initiated by the learner which pursue the learner's interests and creations play a central role in being successful for everyone at any age. The wonderwall concept, which will be described below, sets the table for the feast. This idea playground works extremely well with paper; it offers a whole new dimension when it goes online. Questioning enables everyone to become an EduEntrepreneur. A question is the seed of a solution. Never in human history has there been such a rich set of options, a digital smorgasbord serving the question to understanding to solutions process. To question is to put a process into motion. The first step may be simple, but it takes some courage to take the initiative. Question! There are simple and easy to implement methods for championing curiosity, invention and entrepreneurship that are effective in teams and groups of any size. This process is represented by the graphic on the left. The process begins with discovering and sharing a question. This in turn is generally followed by editing and revising the question, which shapes it into a more understandable and useable form and often generates a collection of related questions. At some point the question leads to attempts and methods for solving the problem or question that has emerged. The links at the top of the page provide practical ideas and tools for doing just that. Even simple steps can face many challenges. Social practices can challenge and repress this essential skill, as indicated by the wide distribution and long history of authoritarian structures which extend on up to dictatorships. The problem though is far deeper than government leadership, even in democracies whose survival depends on a questioning citizenship. As the twig is bent, so the tree inclines. Several researchers have concluded that "intelligent inquiry is an illusion at this point in educational practice" (Graesser, Ozuru and Sullin, 1994, p. 122). Intelligent inquiry has been supressed by many forces. This suppression includes the commonly practiced misperception that an accent on teacher driven questions and testing facts leading to major end of year tests is the key to personal, educational and cultural success. The 21st century is in a transition away from that misperception, a transition whose duration will be hard to measure. In spite of the seeming challenge posed by these transition needs, the thoughts that follow address effective and easy steps for transitioning from current to better models of education that follow emerging questioning practices in the 21st century adult world. Great learning starts by learners asking and pursuing their own great questions and projects, a motivating experience that stimulates great effort (Dewey, 1913). An alternative to common school practice is a question centered form of learning and teaching of many effective variations called inquiry learning (Curry, Cohen & Lightbody, 2006; Furtak, Seidel, Iverson & Briggs, 2012; Hmelo-Silver, Duncan & Chinn, 2007; Youngquist & Pataray-Ching, 2004), as well as project based learning (#pbl) and project based inquiry (#pbi). This idea is central to the philosophies of major educational figures including Dewey, Vygotsky, Piaget, Freire and Papert. Such thinking is further supported by the growing economic awareness in the larger community that question centered thinking drives entrepreneurship, a concept central to the economic health of a community and larger regions (McGrath & MacMillan, 2000; Pittaway, 2009). From a base of effective questioning, a wide range of other options become logical and empowering. The response to a question generally requires sufficient literacy in some media to compose solutions, for which digital literacy has added a rich set of options. 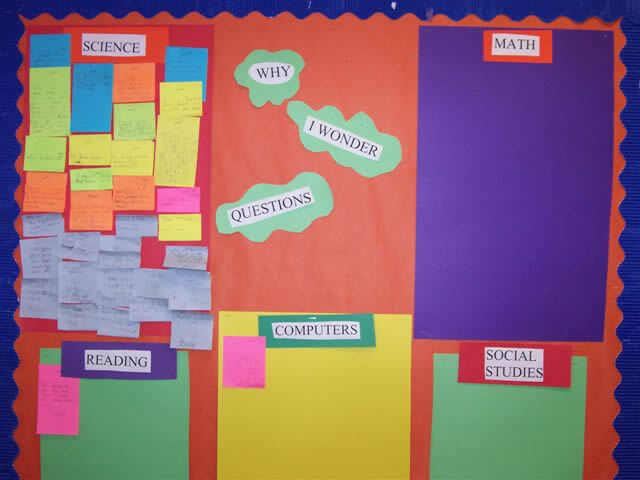 The idea has many names: Wonderwall, Wonder Wall, Poster Internet, Q&A Board, WonderWeb.The location of the questions and responses might be portable to share between classrooms and teams: tagboard, cardboard or paper covered styrofoam insulation board. It might be in a fixed location: the side of a file cabinet or a large wall space. It might also appear online in a Web browser page. The responses might be text on paper, or the paper might indicate an online source, a video, image, animation or some other media composition. Digital wonder walls will be discussed in a later section. A paper method will be discussed shortly. The wide ranging digital media options are so new to education and culture that they have made most of the previously literate citizens of the world illiterate in their ability to compose and sometimes even to navigate (read) the media of these new literacies. The breadth and width of this range can be explored by clicking the animated ying-yang symbol on the left to jump to a view of the digital palette with links to instruction and knowledge of each. At the heart of understanding and composing is the lub-dub heartbeat of the question. The endlessness of the animation is saying in part that reaching ever better solutions requires more questions that lead to ever deeper understanding. There are some great options for encouraging and managing questions and this process. These designs work as well in the classroom as they do in office and team workspaces. 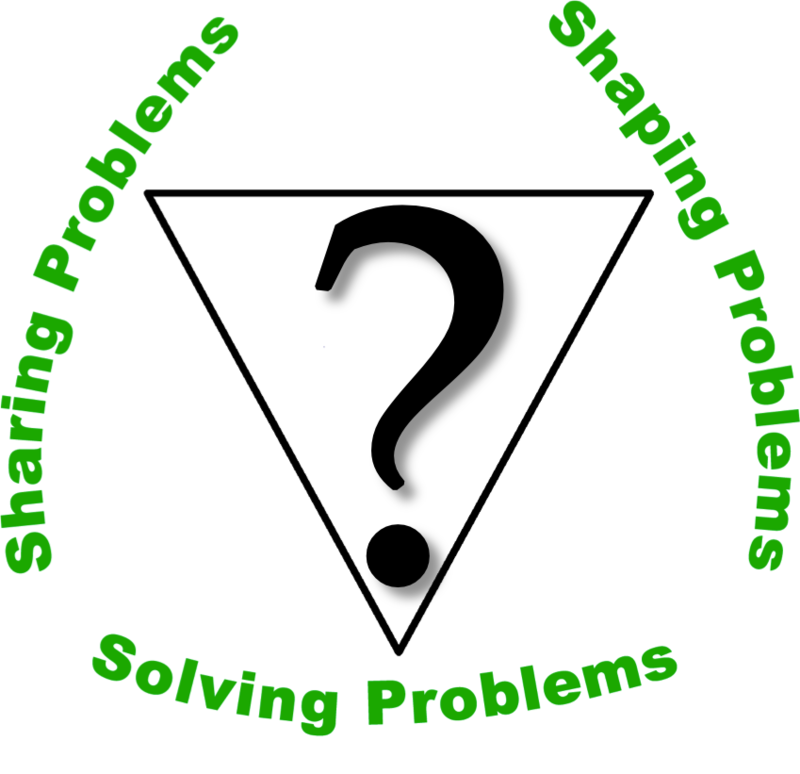 Using the Sharing Problems link and other links at the top of the page, a wide variety of centers and digital systems that support the question, response and inquiry learning process are available online in both prepackaged and "roll your own" models. They provide a continuity, a connecting continuum of activity from childhood to adulthood. This idea of synergetic energies where each forms and contains the seeds for the other is ancient in its origination. Said another way, each requires the other, or as Piaget noted in his book title, "To Understand is to Invent" (1976) and to invent requires questioning. In the 21st century this process continues in ways that constantly open the door to a digital palette of ever richer forms of communication and composition. Highly prized inventiveness and creativity depend on the initiative of question asking, shaping and solving through the use of higher order questions. However, research indicates that bringing further adult minds to the power of questioning is slow and that advancing the habit of effective questioning in school classrooms has not yet been successful (Graesser & Person, 1994^; Tower, 2000^). Fortunately, Common Core requirements have breathed new life into the importance of stimulating a wide variety of types of questions within classroom practices (Bellanca, Fogarty & Pete, 2012). Given today's challenges in helping the 7 billion people of planet Earth thrive, our rapidly evolving global culture needs new ideas that actually deliver an explosion of "real-world" questioning and problem solving within our classrooms and organizations, questions that can help digest the current information explosion to improve life for everyone. The ideas of this page focus on systems that work to champion questioning in personal, classroom and office spaces, designs that do not require digital technology, yet create great synergy with it. Creating a question of personal interest may be the most important single sentence composition that a person can make. How do we build questioning skills, an increasingly critical 21st century skill? By what teaching methods can we build bridges between the world of paper that dominates classrooms and the digital world that dominates the growing part of the adult economy outside the classroom? How do we build recognition of the transformation in learning the Web brings and awareness of possibilities for those on the wrong side of the digital divide, the have-nots of our classrooms in the digital age? We do it with the common ground that we all share, questions. Questions are the brain's attempt to actively learn, to help new information connect with what it already knows. When teachers highlight and respect thoughtful student questions and integrate student questions and problem solving efforts into their lessons, they also build learner motivation in a number of different ways. 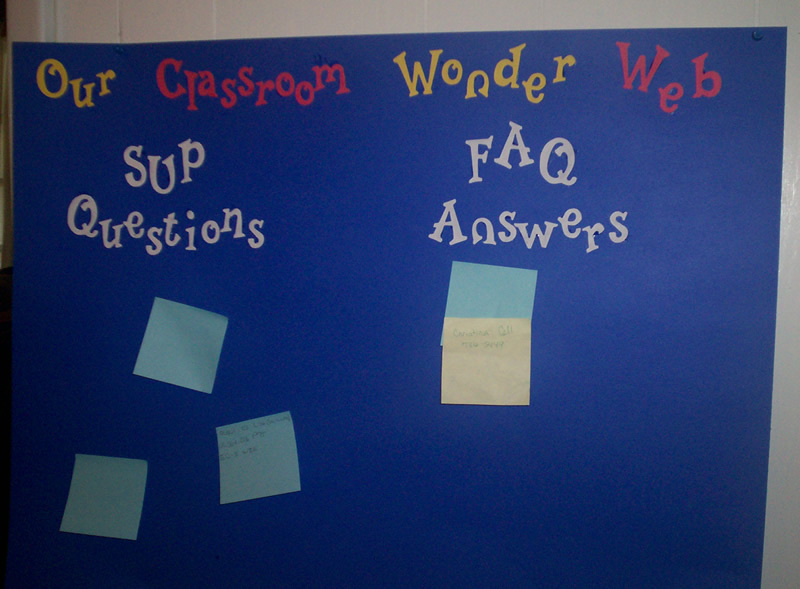 The clickable picture on the right of a teacher's developing wonder wall board, a place for student questions and responses, is a concrete example of possibilities, a concept that can be implemented in an endless variety of ways. The questions and brief contributions to those questions posted on such walls can easily be expanded through research and study into a wide range of more significant compositions age appropriate to the maturity of the question makers. Such questions provide the stepping stones to exploring an entire palette of digital options for expanding and expressing progress towards solutions. Makers and composers begin as question makers. The information age with its high rate of change has developed new systems that better support dealing with rapid questioning through search engines and search queries. Using just the known rate of question asking on the Web, the results indicate that the adult questioning asking rate is at least 20 times higher than students in school where students are expected to be asking questions. Should an effective classroom and school flip that around? This suggests that new classroom practices should design systems that work in parallel with traditional "raised hand" questioning to drive the questioning rate skyward. Questioning is a key skill and habit that is needed for finding what is new and learning more about it. Questioning is also a fundamental reading skill that needs to be occuring while reading. Questioning is also critical in helping learners regulate their own learning. These thoughts explore a method that teachers can use to radically accelerate not only the quantity and quality of questioning but also provoke more problem solving and answering at every age and content level. That is, WonderWeb activity to be described further below also encourages reading and writing and all other forms of composition as well. Teachers need motivation too. Their questions also need answering. Why is this WonderWall concept important? Am I doing any good in the world? Such questioning activities are not just good for the classroom curriculum goals, teachers and learners; they have significant real world value. The global need to find and share questions, then follow good procedures for working out solutions is almost incomprehensibly immense. The Internet has provided us with a global and almost instantaneous connection to billions of Net users. The Net provides all kinds of systems for building on classroom teaming by putting together questioning and problem solving teams together that work across classrooms, across school districts, states and nations. Further, the digital knowledge explosion (Houghton, 2012) has gotten so fast and so huge, that it is growing far faster than the available human systems can use the information for questioning and answering. World culture is losing the race between understanding and the growth of new information. It is losing because there are not enough people with the skills to use the incoming data to find and solve the problems and build the businesses and organizations that can sustain solving the problems that surround us. Are teachers important? It has never been more true. Authentic questioning is an important adult activity that needs better transfer to school practices. In December of 2009, comScore (2010) reported that the 170 million American users of the Internet generated more than 22 billion search queries, averaging over 133 searches per American in just that month. This number continues to climb. In contrast, studies have shown that in the common teacher centered classroom the average student asks 1 question per 7 hours of instructional class time, and then primarily questions at the lowest level of thinking skills. Factoring in the number of hours instructional time and adult use of the Internet, Web using adults are doing 20 times the questioning of classroom students. Further, some 96% of school questions overall come from the teacher. Of those teacher questions, only 4% of teacher questions model higher level thinking questions (Graesser & Person, 1994). By comparison, some research shows that 1 on 1 tutoring environments can reach 26 questions per hour and 120 questions per hour when all information must come by asking questions (Graesser, Ozuru and Sullin, 2010). Against this challenging situation, our understanding of the importance of quality questioning through higher order questioning continues to grow. Others are concluding that the presence of higher order thinking skills is an important measure of educational quality (Renaud & Murray, 2007), a perception that is well recognized in the Common Core's higher order curriculum goals. This range of scholarship indicates a need to create places and systems for thinkers and learners to reveal and share their questions, their wonder about topics of study with each other without having to always route them through the teacher. Single points of access for information have always become bottlenecks at various times. In classrooms such bottlenecks restrict learning and can lead to disruptive behavior. Most discipline problems, at their base, are curriculum problems that were not recognized or fixed. As our classroom inhabitants are growing up playing in the "big pool" of cyberspace, children need practice and guidance in designs that parallel what working adults are doing to grow their economies and improve cultures. As long as the teacher or librarian frames the questions, student will not learn how to ask and answer questions independently. Modeling good question strategies and demonstrating appropriate questions for different objectives only begins the process; young people need to be actively engaged in the questioning process (Farmer, 2007^). The wonder activities about to be discussed can begin with the paper supplies that teachers already have. This can be done and should especially be done where there is no or extremely limited computers access in classrooms, though the greater their availability the greater the rate of questioning and responding that is possible. One of our educational roles is to help 21st century learners transition from the culture of paper to the culture of the Web. The transformational possibilities for developing independent learners is increasingly observed and documented by netizens (Solomon & Schrum, 2010). A design referred to variously as a wonder-web, wonder-wall, or Internet poster is of minimal expense and can be used to guide this process. All groups, whether offices or classrooms, can benefit from non-digital systems (paper) that help accent the value of curiosity and creativity through raising questions about the tasks at hand. As the clickable picture above by Lisa Finch of her fourth grade classroom Wonder Web indicates, they can take up little space, yet be highly visible, colorful, entertaining and always changing. Many creative Wonder Wall designs are possible: PG's first grade; John Greene's 6th grade; @ricktkrause; @2ndgradetweets; @Kathy_Rice; @ClarkKindies. As a side benefit, such visual displays can be explained as a paper version of the role of the Internet. Net access just means there is an added benefit of using the global Internet for sharing and questioning systems. These non-digital or paper based systems will parallel and expand on the way learning and sharing occur on the Internet. In these systems each participant becomes the ambassador for their own questions, seeking others to help in discussing and researching them to make better contributions to their solution. Questioning skills have critical learning, social and economic implications for the knowledge culture in which we now live. 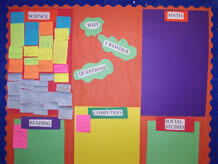 paper bulletin boards can easily be extended with the numerous tools of the World Wide Web to store and share electronic messages that raise questions and research and responses that lead to solutions. Though questioning has been the focus of this thinking, the question merely sets up the activity that should follow. The process of responding, of problem shaping and problem solving (see links at the top of the page), benefits from a number of models and approaches that require creativity and critical thinking. For those needing more on how to generate creative solutions, Ward (2004) addresses a number of models that work as well in classrooms as they do among idea generation activities that begin entrepreneurial activity ("Entrepreneurial", 2012). It is of critical importance that the questions and responses that are generated are not seen as homework for the teacher to answer. They should be seen by the teacher as one end of a connecting thread to students' minds and interests, their interests. It is not the teacher's role to answer the questions on the bulletin board, but to lead the student to the skills and knowledge to invent their questions and to work on finding a sufficient response or answer to their own question or one of others. It is the educator's role to find methods for responding to the problems and questions of others, to build a team spirit in which all contribute to each other's problems and questions. Note that this eventually becomes a fundamental career and social skill. If you could not do this, who would hire you? If the organization/business didn't support this, how would it survive the fast pace of cultural change? If you don't participate, how would your neighborhood and community improve? it is important to move from concept to actual classroom implementation and put some practical design in place. The tagboard wonder web, wonder wall or the poster Internet are just different ways of talking about the same thing. Its operation can take many different forms and purposes. Smaller versions such as manila folders might be used for small teams, larger wall areas work well for an entire class. There is one universal design and an infinite number of ways to make an attractive display for it. 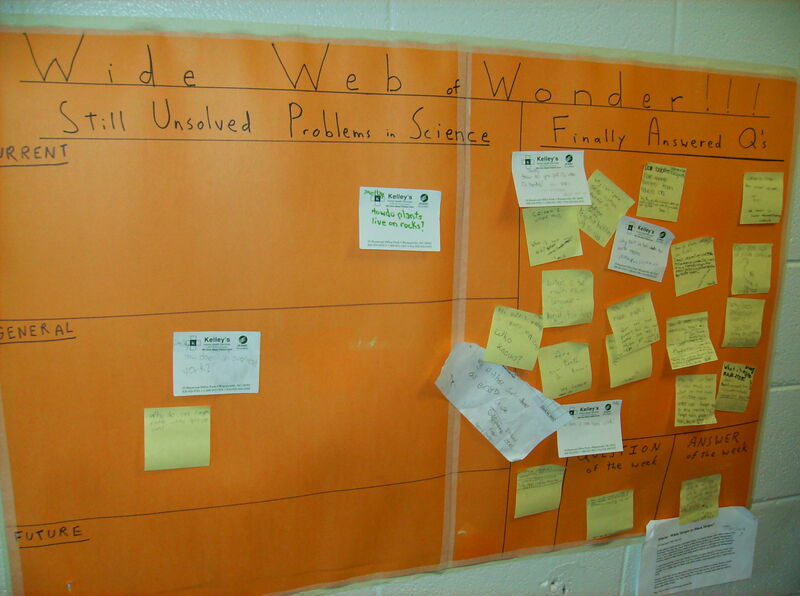 For an added thrill, try putting the wonder web system on 4' by 4' styrofoam boards (covered with paper) and periodically trade boards full of questions between classrooms as well. if not using the more expensive Post-It notes then have several scotch tape dispensers; pencils near the poster area. a strip of paper in a large font saying Wonder Web or Wonder Wall. For longer term use, laminate the tagboard, especially if scotch-tape is used. If you have the whiteboard space to spare, then there is no need to laminate. Another special note. I have a bit of trouble with the word Answer on the right side of the poster, as in Finally Answered Questions. It is important to teach that the best questions often don't have simple or definitive answers. They are open ended questions to which we make contributions, sometimes for decades or centuries. Play with the vocabulary to fit your own students. At some point the question askers will find the contributions sufficient and move on. Yet it is important for them to understand that finding and answering questions is one of the major roles of colleges, universities and the research arms of many large businesses. Each of these types of institutions has people who can easily visit your class via web conferencing systems and discuss the research work they do and the process they use. When possible, integrate access to even a single computer with Internet access somewhere in the building or the classroom, using it for further research on their questions that go beyond the resources of home bookshelves and the school library. This procedure has the teacher or just a few students writing. It is especially effective with those who are learning to write. When the class has finished listening to the teacher reading a story, whether they have gathered on the floor or are at their desks, ask for things the story has made them wonder about. For one or more of the questions being asked, do not answer it at this time. Instead, indicate that you want the class to think about that one. For those not yet writing, the instructor records the question.. If their writing skills are up to it, then teacher should ask the question asker to write it down, date it and put it on the Wonder Web display under SUP (Still Unsolved Problem heading). If time, add more unanswered questions. If time, you might go beyond the story and ask if there are other things not related to the story that cause them to wonder. At another time that day or a different day, ask the class for responses to the question on the poster. Choose someone to write their response and staple or tape it to the bottom of the original question. There might be more than one response, that is several interesting variations to the responses for some questions. The teacher might add their own response. However, the goal is to keep this student centered, student answered. Teaching method 2 assumes some writing ability. This procedure has all students writing and working in teams. Distribute two of the 3x5 cards. Ask each participant to write any question that they would like that is a genuine, real or authentic question emerging from their personal interests and/or study of a class topic. On the 3x5 card, write your name, date, keyword or very short subject of the question and the question. Only one question per card. Participants might think of this card as a postcard, a record in a database or an email message. The bulletin-board in effect becomes "poster Internet", a microcosm, a miniature model, of the problem solving nature of the Net. While participants are writing, one approach to get more interaction is to divide them into teams and seat them so that 4-6 are around the tagboard or opened and flattened manila folder, with tape and a tape dispenser. Without taping, have them lay their questions on the left side of the tagboard when they finish writing. Each member must read the question that each places on the tagboard. Next, they should pick up a second writing slip (3x5 card, paper scrap,, etc.) and use it to write an answer or a contribution to any of the questions. Tape the answer card to the bottom of the original question card. If the question askers feels that the answer is sufficient for them, they should tape the top card in this set to the right hand side of tagboard. Label this part of the display area, Answered or FAQ (Frequently Answered Questions). On the left side, the unanswered question areas will be labeled Question or SUP (Still Unsolved Problems). [You could also have one large tagboard as a whole class bulletin board.] Provide a stack of 3x5 cards for the students to use when ever they wish to make further contributions of questions and answers. No matter how many contributions are made, the question asker not the teacher decides the placement under SUP or FAQ. Some teachers use inexpensive scrap paper and other use more expensive types of paper like post-it notes. If and when your students gain access to an Internet capable computer workstation, have them take an SUP question of the student's or teacher's selection and move to the Internet workstation and research. Their research should be copied to a 3x5 card and taped on to the question card as another contribution. They might also use existing resources on library shelves to work on the question when in the library. A contribution might consist of a web page address or a book title and its catalog number. When essay writing must be done, the questions can serve as topic ideas. Selected examples of essays that respond to the questions might surround the board with a number or piece of thread identifying the relationship between question and essay. As will be discussed below, the Response note might contain a web address of a blog posting, wikipedia page or other web page that contains many kinds of digital media. Once students have completed some variation of this exercise for the first time, you have some decisions to make. How many days, weeks or months will the poster be operation? For just the duration of this unit? Is it a center at which students can gather and work? Are the questions to be focused on just one topic, unit or lesson, or is it open to any kind of question on any topic? Label the poster with its timeline and its topic if it is to be focused. How many posters? Make a decision as to whether you will consolidate all work to one tagboard poster for the entire class, or continue with several team posters. Take a close look at the classroom environment. Do students trust you and their classmates? If not, what must be changed? Expect that the first questions asked will be test questions, often at the basic recall level. They are test questions to see what you as the teacher and their classmates will do with the knowledge that they do not know something. The older the student, the more this will hold true. This needs to be discussed and expectations for classrooms rules made clear. With time and a sense of pyschological safety, along with persistence, higher order questions can and do emerge. Depending on how badly damaged their sense of trust in adults and peers has become, this can take weeks or months. The Think link at the top of the page provides much more on different types of questioning. It is important to actively model and provide direct instruction in a range of higher order questioning patterns as a part of lessons in different content areas throughout the academic year. "This week is Analysis week!" Openly cherish questions that hit on different levels of Bloom's Taxonomy when they appear. Challenge them to decide where in Bloom's taxonomy a question might fit. It is not always easy to do so. There are many other creative approach you can take. For example, if you know their questions well, as you plan your instruction, promise that a lesson will answer certain question. Read the question outloud but tell them you will not tell them when you deliver the answer during the lesson. They must be careful listeners and raise their hand when it occurs to them. If no one has discovered the answer by the end of the lesson, then that becomes a good review activity at the end of the lesson. There are also many good ways to make a portable poster. Simple tri-fold boards can be found at many office supply places. One of my favorites comes from your local home supply store. Buy a 4x8 foot sheet of 3/4" or 1/2" foam insulation board and cut it in half to make two sheets that are 4x4 feet in size. If you buy thinner than 1/2" it will not be stiff enough. For easier movement in and out of a car, cut again into 2x4 foot panels.Your school will have rolls of poster paper in four foot widths. Cover the 4x4 or 2x4 poster squares with your choice of color. Further, the foam can be cut to any size. These can be hung on the wall or stand wall on the floor for a learning center activity. Experiment! One approach would be to use the poster piece or pieces for an entire class display dividing it into SUP and FAQ space. Another would be to mount tagboard on the poster for four teams if four pieces of tagboard are trimmed down to 24 inch width. This way four sheets of tagboard can fit on one side of a 4x4 space with four inches of room at the top of the poster for an identifying label. If you use stick-on picture hangers from a photo-supply store you can mount and unmount the tagboard enabling class teams to take to their own workspace. These are extremely light and portable making them easy to hang or mount on a wall. Two of them foam board pieces can also be hinged with duct tape to stand on the floor and once the hinge is closed, the two together protect attached papers when moving the display. Their light weight makes it easy to trade posters between different classrooms. The Wonder Web becomes one poster space that your students, not you, can maintain all year long. As the year progresses, take some questions and develop a larger response/contribution than just a few sentences on a post-it note. This is especially motivating if it is a question that comes from a community member that they know. The class could be led to create any form of composition, such as essay, Web page, Web site, computer program, video, musical composition and so on playing out the entire digital palette of options. This activity could begin with teacher modeling and then shift to whole class team assignment in which everyone does some part, or multiple teams which each take on a different question. As Net resources expand in your school, team with teachers from around the world and team with their classroom students on a problem. The iEARN Web site is one of many systems for linking teachers and classroom projects globally. The trillion plus pages of the Web that integrate the media of the digital palette were generally built, one page at a time, in response to some motivating question or problem. The Web functions as the world's largest idea processor as well as the world's largest single repository of expertise. The 1:1 movement in which each child has its own digital device (laptop, touch tablet, etc.) is well underway in North Carolina and other places around the world. The day will come when your classroom will need to be more active in using the Web and then a larger system and procedures are useful. As classrooms are ready to think beyond classroom walls, other extending designs and methods become effective. CROP, Communities Resolving Our Problems, is a way to think about extending wonder walls from paper to online. eCROP or CROP is first a concept, that a community of whatever size, type and scale should be the engine that uses its own questions to solve its own problems. A classroom is one kind of community, but the idea of community scales from 2 people to a neighborhood, then to a town, county, state ore the 7 billion members of the planet and every grouping in-between. CROP is also a procedure for making a kind of idea processor that can be expanded and enhanced in many ways. CROP is also about producing a crop, not a crop of carrots or tomatoes, but a crop of questions and a crop of answers and a crop of teams that build organizations that work on steps towards ever more powerful answers and services. Teachers already play the interface between their students and the world of knowledge. They can also become that interface between the students and those who can be contacted via the Web. Depending on the age and maturity of students, we don't expect them to interact with strangers without adult supervision. Where direct interaction with other adults is relevant, that is a teacher's role. Using a teacher created account, a teacher can use their own name or a fictitious handle that students invent for a teacher created account to use the Web's many communication systems to seek answers to their question from the Web's global community. Naturally students are inquisitive and smart and will realize they could do this from home, so it is important to review Web safety and parent support just as we review safety issues for crossing the street. It is also important that parents understand the role the teacher is playing and that teachers invite parents for some instruction on how to play an intermediary role for their own children, supporting and facilitating, not directing. Numerous online WonderWeb type systems provide a digital parallel to the paper WonderWeb and new ones come online continually. Three variations are highlighted in the graphic at the beginning of this section. Yahoo Answers, with over 70 million users, is the largest and most active so far; its users are largely adults. 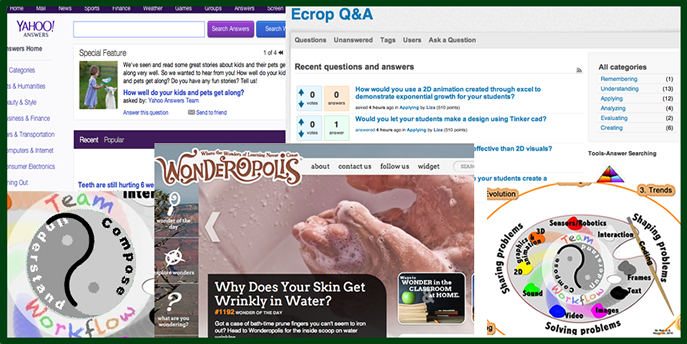 Wonderopolis is a curated and managed site that seeks questions of wonder and would have many uses for schools and children. There are also "white label" products. These commerical and free open source software can be run on the school district's servers so that schools can run a digital WonderWeb behind a protected digital firewall that only school districts students can use. Question2Answer is one of those. These sites can also be used as a source of questions and challenges from the "outer world" beyond the classroom, questions that can be collected by teachers or students whose teacher would then post themon the SUP section of the Wonder Web. Any answers students create can be posted by the teacher back to an online site. Even Trivia web sites can help stimulate the questioning process, especially if students are choosing their own trivia quizzes in pursuit of their own question topics. Fun Trivia lists almost 3,000 quizzes for children. Googling "trivia" will reveal many more such sites. The Information Pyramid's person page provides other more detailed and specialized ways and Web systems to ask questions and pursue finding problems and questions as well. In the long term, classes should engage in both the classroom's paper Wonder Web and the online question databases while the number of computer workstations in the school building increases. Once students gain significant access to Internet connected workstations, the Poster Internet in the classroom will help keep the concept visible. That is, use the Poster Internet in reverse of the previous process. Questions that emerge in the online question databases can be printed and added to the class Poster as a form of focused promotion or advertisement for their topic. To further enhance this concept, topic oriented web pages with links to related online question response pages and related resources can be also be created. Teams or the entire class could even create a group name under which to post questions and responses, an approach the bourbaki mathematicians took a century ago for publishing anonymously as a mathematical team. A more advanced step would be to create a community service process by which your students become Community Question Ambassadors. This process encourages community members, content experts and parents to contribute real problems on a paper form to the class wonder board. As their skills grow with the wonder web board, the next step is to challenge students as individuals and teams to respond to an actual community member's question. Community members could also contribute to an online database that the teacher is monitoring and encourage students to look for and bring to class problems provided by community members. Teachers would want to do workshops in the community and on parent night that would explain the process. Of course, student 3x5 cards added in the classroom should still be encouraged. Paper plays an important role in keeping the questions and the question process in the visual field of observation every day. Older posted questions which have been added could be removed to to an online database to make room for more on your class poster as necessary. With the community's problems generating curriculum activities that lead to some results, a whole new world develops that benefits not only the student but improves community attitudes about the value of schooling. It may be some time before all students have their own digital device which will hamper online wonderwall activity. Until schools and have fully adopted 1:1 digital devices and deep education about them across a school, a digital divide will remain as the new "Iron Curtain" of the 21st century, putting a wall between the poor in knowledge and economic wealth and those rich in knowledge and economic wealth. It is time to tear down that wall. The Wonderwall using paper is certainly effective before the Web and Net access are not yet available in the students' hands. It plays an even larger role when Net access is available. Used properly, it can lead the transition in closing the digital divide. Imagine, just for a moment, a point several years later, in which the school district leader makes an annual or even monthly announcement about the number of incoming community questions and the number of answers that were generated by the educational system. Imagine, just for a moment, the community recognizing the enormous value of the community questioning system and passing a bond referendum to provide the educational system with even more resources to do it better. Use as many different variations of such question systems as fit the maturity level of your students. Invite your students to carry out this SUP process whenever their study leads to reflective moments, perhaps especially so towards the beginning and end of a unit plan or unit of study. Higher order questioning needs the strategic partnership of a strong base of knowledge. To grow one, you need to grow the other too. The SUP process can also play a role in the assessment process. Compare your student writings with the examples of writing samples on state writing exams. Note that the use of such a process provides reinforcement and practice for meeting the higher order thinking skills curriculum objectives of many states, and the answering of open-ended writing competency questions. Critical thinking and writing skills represent major educational competencies that are also needed for the use effective implementation of state computer competencies across the curriculum matrix's grade levels in many states. There is also a close relationship between this activity and the types of thinking needed for higher-order thinking skill type exams. The wonderweb board also provides a means of assessing the class's progress with higher order thinking skills. It doesn't take long to scan the board and make a quick tally of the types of questions students ask as an assessment measure of progress in teaching higher order thinking skills. Ciardielli's article (1994) explores a pertinent topic, "Did you ask a good question today?" and Graesser, Ozuru and Sullin (2010) responded with an even deeper perspective in their chapter "What is a good question?" The evidence they report indicates that these skills come naturally to very few students; leadership is needed in the classroom and the adult arena in helping these skills emerge. These are many models from which to create an assessment rubric. Though assessing question skill growth is certainly a skill teachers can apply, with older students who have been taught the HOTS model, assign one or more of them to do the tally. How many new questions appear a week? Which ones and how many fit which level of North Carolina's model for higher order thinking? If Marzano's model is too complex to contemplate then consider NorthWest Lab's more simplified structure. There are other categories for types of question, including: the updated Bloom's Taxonomy of cognitive processes from which the Marzano and NorthWest lab models are derived; Graesser and Person's Taxonomy of various depths of questions (1994); and Mosenthal's Taxonomy of abstractness (1996) and others. That is, no matter which categories for higher level thinking that are tried, the rubric for each has something to teach the teacher. How many evaluation questions are there? How many new ones? How many analysis questions are there? How many "if based" inference questions are there? What do the absences of some types of questions suggest for the instruction that still is ahead? Every system will require some invention and creativity on the part of the teacher to create a good fit with the age ability of the participants. Below are some common problems that teachers face, but these won't answer every question or solve every situation. Be inventive. The first step is to encourage students to ask questions. However, the deeper this is explored the more planning and scaffolding that is needed to keep students advancing until they achieve independent of that scaffolding. Anderson (2002) and Flick (2000) provide a number of examples for inquiry scaffolding	. Much depends on the content, age and literacy levels of the group students or adult teams that work on the questions. In short, at some point research, thinking and problem solving can become more complex than someone (at any age) is prepared to handle. In such situations, this is where leadership is required to reduce the requirements and cognitive load so that that process can constructively conclude showing results of work in progress. The too challenging elements simply become questions that are noted for others to pursue. What does one do with questions that do not get answered? Wonder Webs will get full, eventually. Here are some suggestions for questions for which no one responds. Create a manila folder with a special name that is meaningful and catches the imagination of your students. It might be SUP (Still Unsolved Problem) Honor Roll Questions, Distinguished Questions or Cold Case Files, Stumped the Class Tough Questions or Questions Hall of Fame. Decide in your own mind that their question's space will be reclaimed for one of two reasons, a reasonable time duration or the board is getting too crowded. Either is sufficient to make a big deal of “retiring” a question to this Question Achievement folder. Challenge students to ask for the Question Achievement folder to see if they can become "cold case" detectives. Put a committee of students together from time to time to pull out a question from the "retired question" or "cold case" folder, using that question as the basis for sending a query to an expert seeking someone that would join the class as a guest speaker or come on electronically via Web conferencing software or even on a speaker phone. How can one handle students or groups who do not volunteer questions? It is important from time to time to make asking a question a requirement as part of a lesson, not an option. In fact, for those that wish to thrive in the expontentially changing world of the 21st century, questioning skills are essential, not optional. It is also important to formally teach higher order thinking skill (HOTS) question patterns on some kind of rotation basis thru the HOTS queue, in which everyone must periodically write an analyzing or creating or evaluating question or some other category of higher order question. A key factor in teaching students to ask questions, particularly deeper questions, is their sense of cognitive dissonance. That is, questions are more likely to emerge when there is a challenge to what they thought they knew which creates uncertainty about how to proceed (Graesser, Ozuru and Sullin, 2010). This is what Ciardiello refers to as the "Puzzle them first!" (2007) methodology. Periodically have students choose one of their questions created during a question creating time to put on the Wonder Web. Once someone gets a response to a question they have asked or discovers its larger importance to others, they might “get game” and become more questioning. But to get their authentic questions, which is of course the goal, there must be a community that trusts one another to be respectful. For some age levels, a discussion about what extinguishes the fire of questioning will be a valuable and perhaps provocative process. This is as useful a discussion for teacher meetings as for students, as schools, behavior management rules and school policies can play a role in distinguishing the questioning fire too. Periodically have some group or committee form question-teams where everyone has a post-it note and passes it around their circle for a response, perhaps at the beginning, middle or end of units of study. Give some praise for those questions that don’t get answered. Note that for older students unanswered questions are the basis for funding for grants, new careers and job promotions if they can get others to see the importance of the question. Generally, there will be some effort eventually by someone to to see if they can stump their group. Great, but then make it clear the question answer is the parent of the question and must help it grow up to be answered which sometimes requires their initiative in seeking the help of others. Sometimes the greatest problem is that students fear the ridicule of teachers and their classmates as the result of experiences that happened before your class. Spend some time just getting to know those who are not asking questions; still water can run deep. Create an anonymous question asker name that students can use if you authorize the question to reduce such fear. That is, all questions on the board must have an author that the teacher knows or be removed. So, they can give you their question privately for you to post anonymously. Practice patience; this process builds over weeks and months. And years. It is also important to work on question motivation. It is important for students to see the value of questioning and answers outside the classroom and school scene, which makes for a good field trip; load up the school bus and drive down the business district of the community. Before they get on the bus with their notebooks tell them that every business and product that exists is an answer to a question. Can they find the question or questions that each business answers every hour, every day? Ask them to make a poster of pictures of businesses or show students a sign for a business and see if they can come up with its key question and supporting questions. Show them a science based product and see if they can think of the question that spawned it and the additional questions needed in different content areas to get it to work properly. For older students, have them see going to the Web as a kind of field trip. Who is charging for what? See if they can hunt down the business data for business on Main Street or on the Web to determine how much money the company is making annually in continuing to answer that question or questions. They might find out how long the company has been in business answering that question type and related questions and how many employees are needed to do this work. Trade question boards and "cold case folders" with other teachers and see what their students come up with for responses and additional questions. And yes, primary students can sometimes solve intermediate grade students questions and so on up the line. This can also become a great challenge for the top end of the class. There are many other possibilities and options I will not have thought of or other exciting board designs that you have created which are not shown here. I'd love to hear from you and see pictures of the evolution of the notes. So, here are some questions. What other creative ideas can you add to this? What does your board look like and where is it located? A link to my email address is below. Won't some students respond to any amount of required questioning (e.g., grading by some quantity of questions) by posting trivial and insignificant questions? Of course they will. But without the requirement to participate to "prime the pump", only those through luck of birth who were born into the more positive end of the socio-economic spectrum will generally gain from the wonder web board. Without working towards everyone's participation, the profound weakness of the educational system in serving to perpetuate current social and economic divisions will continue. Teachers can also do much to model better and deeper and to teach students to make those distinctions (Bintz & Williams, 2005). As one of dozens of examples they provide, Bintz and Williams note the idea of "thick" and "thin" questions, examples of the former include "why" and "what if" and the latter would include "how far" and "when". The results of requiring questions are similar in both adult and child environments. Some will take the activity seriously sooner and find something in the content or in their life to be curious about. This is normal. Over time, students will see many types of questions modeled. They will learn that those who ask authentic questions learn something, and those that don't only gain knowledge of question types, not any content or personal application. The time that it takes for the discovery of the personal value of relevant questions varies widely. All students eventually learn that their peers are gaining something that they are not by asking personally important questions based on real inquiry into a topic. This discovery takes persistent effort which requires a steady requirement into such activity. Students and teachers will also discover that questioning students comprehend more (Bintz & Williams, 2005). Grading for quality of question or trying to determine personal relevance poses too many challenges for it to be an effective use of teacher time. Our primary educational goal K-20 is to encourage self-motivation, personal initiative and the growing independence of learners. The most important and relevant research on this problem has been on the topic of extrinsic and intrinsic motivation. Extrinsic rewards from grades to trophies have been proven to be of short-term value, expiring shortly after the reward program ends. Intrinsic rewards, the discovery and understanding of personal value, have been shown to provide excellent long term and life-long benefits. Adults reach this understanding much sooner than less mature students in K-8, but it still takes time for everyone. It is important to use authentic student classroom questions to address content area that can help generate further understanding. This is of particular value in teaching situations in which the same topic is addressed over many weeks. When steadily changing topics in adult education, it is so far perceived as best for the teacher to participate in the question response, but not to attempt to answer all questions. But whatever the pace at which new topics arise, teacher/instructor/professor must be perceived as helpful and yet in need of help, not someone that can answer everything but benefiting from the value of the whole class acting as a team in finding what the teacher cannot address in the amount of instructional time available. This means that a regular part of lesson planning should include the teacher leader scanning the wonder web board for a useful or relevant question of a student to slip into the lesson. The CROP system helps generate a need for others to provide relevant responses to questions. It also generates a sense of personal value in contributing to someone else's growth, a factor critical to an individual's sense of self worth. Self-worth, knowledge of the personal benefit of learning and curiosity are central factors in whether students will eventually become dropouts from the educational process and dropouts from making positive contributions to society. But this is an open research question as to whether discovering this as a self-discovery event or stating this directly is the most useful way to communicate this. Teaching is more art than science. Which do we know and use more deeply, self learning or delivered information? How much assigned reading is never read or never read reflectively and deeply? It is especially important in the age of the knowledge explosion for each individual to come to understand that they cannot know everything, but that they can benefit much from learning more. There has never been an age in which the tools of inquiry were as rich, powerful and productive as the the 21st century. By being observant, teams of like-minded individuals that have particular interests can be pulled together across almost any distance. In this age of social online applications such as Facebook and many other options for sharing and interaction that the Web is inventing, the options for questioning teams are immense. Teams of like-minded individuals who are knowledgeable about team skills and how digital skills can support such team effort can learn more, and learn it much faster than those working alone. Such skills are essential in extending entrepreneurship questioning and business formation into our global age. Entrepreneurs put new teams together to solve new questions. Self-initiated team building activity is not just important to personal learning but to economic development, particularly with regards to the idea of entrepreneurship. Just as smoke is a good sign that a fire is nearby, persistent questions and social formations around a related set of questions across a population are a key sign pointing to the opportunity for organizational and business formation. Entrepreneurs thirst for interesting questions that many are asking. Conversely, the decline of questioning and social formation around a business practice is also an important sign that a business needs to evolve. If not, at some point in the decline of questioning, the business will end. There is a natural bridge between question asking, inquiry and entrepreneurship (McGrath and MacMillan, 2000; Pitaway, 2009; "The Entrepreneurs", 2012). Though questioning is a critical element of entrepreneurship and other problem processes, this question discovery process is merely the kickoff. Bending or shifting the question into different forms of expression and types of questions is often essential to being to get a grip on a path towards a solution. The right question expressed the right way can create a natural bridge to the third phase of the process, problem solving. As shown by the arrows in the graphic model on the right, this three phase or stage process is not necessarily sequential. Any phase might be the jumping to either of the others. A diverse range of programs and program models also exist for expanding beyond question pools that schools might collect to actual entrepreneurship study and organizational formats for all ages (e.g., Consortium for Entrepreneurship Education, 4H, Junior Achievement, MOB and NCREAL). There is great opportunity for classrooms to use the question process as a way to study and actually implement entrepreneurial practices (Houghton, 2013) as further motivation and demonstration for the value of questioning and knowledge. This collective action to create question pools for educators is one type of an idea known by many titles (Doan, Ramakrishnan & Halevy, 2011), and often referred to as crowdsourcing. Organizations, including governments of various levels local, state and national, have generally either solved problems by using or hiring more internal staff members or hiring 3rd party contractors to deal with a task or issue. The Web has raised a third way, crowdsourcing (Brabham, 2008), into an equally accessible and competitive alternative in both quality and cost when the conditions are right (Afuah & Tucci, 2012; Howe, 2006). Crowdsourcing means seeking potential participants to solve a task or challenge by using a communication system that can reach a wide number of people (e.g., a crowd), an approach which goes back to the government use of newspapers for public calls as far back as the 1700's for solutions ("Following", 2008). Such an idea was a perfect match for the global nature of the Web. Numerous Web examples in multiple categories for a wide range of problem types have been invented (Doan, Ramakrishnan & Halevy, 2011). New ones are still emerging such as sifting and organizing large collections of information (Chilton, Little, Edge, Weld & Landay, 2013). Crowdsourcing research has often presumed that there is an individual or organization with a problem to solve but what if the problem is the discovery of the problem itself? The problem finding issue creates a large challenge faced by communities and entrepreneurs. Numerous free, open source and paid crowd solutions for problem discovery have appeared as Q&A or question and answer systems and more specialized and localized 311 city based non-emergency problem reporting systems (Houghton, 2012). To date, the largest general Web-based Q&A community has been the Yahoo Answers site with millions of users and billions of questions. Some areas of development seem to be untouched by the considerable development of crowdsourcing systems. Such systems in effect provide an immense range of problem solving curriculum for the community and culture at large. However, such Q&A curriculum resources are still rarely if ever used by school systems which themselves claim to be systems teaching problem solving skills. Second, such systems have not been used to pull together, prioritize and distribute problem areas of high interest to communities across a range of scales (e.g., neighborhood, city, county, state, nation) for consideration in profit and non-profit entrepreneurial activity. Third, the combination of community problem solving by educational systems and entrepreneurial discovery would seem a logical combination for crowdsource development but are yet unconsidered or utilized. Curiously research has shown that those farthest from the field of expertise that is sharing the problem have been best able to successfully think "outside the box" for many interesting problems (Jeppesen & Lakhani, 2010). This suggests that those learners within an educational system have an excellent chance of making significant contributions, including the potential to invent their own eventual employment. Because so little school integration has occurred with community Q&A systems, a good understanding of the range of ages capable of such thinking is yet unknown. At some point, some enterprising programmers will develop software with sufficient intelligence to sift pools of questions and answers and kick out possible topic areas that have the highest priority for the community development of entrepreneurship. Until then, the key is to build the questioning habit and question pools and then manually search those lists of questions for higher interest topic areas, areas of opportunity. The emerging interest areas happen rather organically with current online questioning databases if its users tag their questions with keywords related to the question, such as is built-in to Question2Answers. Question2Answers and other similar software applications are free question-answer applications that can be put on a server at any institution and modified for their functioning in different ways with different organizations. These systems can also be programmed to pass questions from one team or organization Q&A server into a "master" site or central gathering site of the questions from several groups or institutions, taking advantage of the localization of questions and their larger combined possibilities. The creative possibilities for management, administration and education seem endless. Questioning is more important than answering. This is not to say that answering is unimportant. Instead it is saying that in a rapidly changing world, in the era of a huge knowledge explosion, the location of the accent mark has changed. To create understanding, we still need to pronounce all the syllables but in the 21st century model the accented syllable is the question. Thinking must be taught and this coin has two sides, composing and understanding, which is what answering is supposed to reveal. A question is the first composition and some questions have the power to carry inquiry for weeks or for lifetimes. Though the wonder-web board method provides incentive for questioning, specific forms of higher order thinking will still need to be taught and modeled as part of classroom instruction. Further, having detailed knowledge of the authentic questions of students and learners in any setting provides great opportunity to guide instruction in the direction of enabling them to answer their own questions. Motivation is highest when the relevance of study to the learners' real questions is highest. The teaching challenge is to balance and sometimes to merge the student question with the relevant government mandated curriculum requirement. Motivation and knowledge growth is further improved through extending the paper designs for the paper-based WonderWeb process with digital skills that integrate digital compositions with the World Wide Web, the world's largest idea processor. The Web's crowdsourcing systems suggest there is great opportunity for their integration with educational systems, high student interest and awareness of economic and career innovation. Afuah, A., & Tucci, C. L. (2012). Crowdsourcing As a Solution to Distant Search. Academy of Management Review, 37(3), 355-375. Anderson, R. D. (2002). Reforming Science Teaching: What Research says about Inquiry. Journal of Science Teacher Education, 13(1), 1-12. Bellanca, J. A., Fogarty, R. J. & Pete, B. M. (2012). How to Teach Thinking Skills Within the Common Core: 7 Key Student Proficiencies of the New National Standards. Bloomington, IN: Solution Tree Press. Brabham, D. C. (2008). Crowdsourcing as a model for problem solving an introduction and cases. Convergence: The International Journal of Research into New Media Technologies, 14(1), 75-90. Ciardiello, A. V. (2007). Puzzle Them First! Motivating Adolescent Readers with Question-Finding. Newark, DE: lInternational Reading Association. Curry, C., Cohen, L., & Lightbody, N. (2006). Universal design in science learning: An overview of how universal design and technology can advance science for all. The Science Teacher, March. Doyle, W. (1977, January). Review of Research in Education, 5 (1), p163-198, Publisher: Sage Publications Inc..
Flick, L. B. (2000). Cognitive Scaffolding that Fosters Scientific Inquiry in Middle Level Science. Journal of Science Teacher Education 11(2), 109-129. Graesser, A.C., & Person, N.K. (Spring 1994). Question Asking During Tutoring. American Educational Research Journal, 31(1) 104-137. Jeppesen, L. B., & Lakhani, K. R. (2010). Marginality and problem solving effectiveness in broadcast search. Organization Science, 21: 1016–1033. McGrath, R. G., Ian MacMillan, I. (2000). The Entrepreneurial Mindset: Strategies for Continuously Creating Opportunity in an Age of Uncertainty. Harvard Business Review Press. Paulus, Paul B.; Nijstad, Bernard A. (2003). Group Creativity: Innovation through Collaboration. Oxford University Press. Piaget, J. (1976). To Understand Is to Invent: The Future of Education. Penguin Books. Pittaway, L. (2009). The Role of Inquiry-Based Learning in Entrepreneurship Education. Industry And Higher Education, 23(3), 153-162. Sawyer, K. (2007). Group Genius: The Creative Power of Collaboration. Perseus Books Group. Renaud, Robert D.; Murray, Harry G. (2007). The Validity of Higher-Order Questions as a Process Indicator of Educational Quality. Research in Higher Education, 48(3), 319-351. Solomon, G. & Schrum, L. (2010). Web 2.0: How-To for Educators. International Society for Technology in Education. Tower, C. (2004, June). Questions That Matter: Preparing Elementary Students for the Inquiry Process. Reading Teacher 53(7), 550-557. http://80-search.epnet.com.proxy.ohiolink.edu:9099/direct.asp?an=2984309 &db=aph. Youngquist, J. & Pataray-Ching, J. (2004). "Revisiting ‘Play:’ Analyzing and Articulating Acts of Inquiry." Early Childhood Education Journal, l 31(3), 171-178.